If you are a regular canoer or would like to be one, you will want to make sure you get good quality for your budget. It doesn’t matter if you wish to be paddling afloat on lakes, if you want to go out hunting on your canoe or even just have a relaxing day of drifting on the water with your friends and family, you are still going to need a really good quality canoe. The problem is, with so many canoe choices and options available on the market, it can be quite difficult to pick out a canoe that is any good. Which is why I have compiled a list of the best canoes for different purposes in 2019. If you are an experienced canoer and know what you want or like in a canoe, my reviews will help you be able to pick up the best one and you can probably skip to that section of the article, but if you are new and confused with what to get for your first purchase, this small buying guide will help you out. If you want to pick up a quality canoe, the first major thing you will have to decide on is the size of the canoe. The larger the canoe is, the more it is going to weigh, which is going to make it harder to portage. It is also important to think about where your water access point is so that you can be sure your canoe will fit in the places that you want it to and not get stuck aground. Another thing to consider is that for a larger canoe, you are likely going to need more people to be able to get the canoe in the water to start off your adventure. Generally, you will find that canoes are capable of holding between 1 and 4 paddlers. You should always look at the weight capacity limitations of the canoe when it is afloat as well as the actual weight of the canoe. These are important factors to look at since you want the canoe to be easy to carry to your destination and you also don’t want to over load the canoe out on the water and be forced to bail water out of it. The length of the canoe is another important factor to consider. Make sure that the canoe can fit on your vehicle or trailer depending on how you plan to transport the canoe. A C-2 Canoe (two person) is general going to be larger than a C-1 (one person) canoe, while a three person canoe is usually the largest as a result of having a bow seat. However, you will have to decide if you want to have other passengers on board with you as it will make it more difficult to paddle if they aren’t pulling their weight. In order to make sure that you are buying a comfortable canoe, you should take a look at the seats. Different canoes will use different materials such as plastic, metal, wood and foam to make seats and it is extremely important to have a look at this if you want a comfortable design. The most comfortable seats will likely have foam in their design, which also acts as a flotation device to help your canoe stay afloat if you capsize. If you want to get somewhere fast, you should also consider grabbing a canoe with a square back on it. A square back will allow you to be able to mount a motor onto the canoe, which you can use to troll or zip around the lake to get to your favorite fishing spots. Remember to keep all these things in mind when looking through our picks for the top canoes available in 2019. If you want to get the best canoe for fishing, you are going to need to pick up something that is of a good size so that you can cast properly and something that has rod holders in its design. This is an awesome canoe that you can use for fishing. The canoe is large enough to be able to hold three fisherman at once and it can be used with an electric trolling motor, which will allow you to troll around on the water and get to any spot that you desire. Truly an awesome canoe for fishing and one that you should consider. The canoe design is 15.6 feet long, which is not too bad for getting in the water and will fit on most trailer’s and trucks for easy transportation. The unit has three built in seats that are made out of plastic and have holders on either side, which you can use to store your fishing gear. The nice thing about this canoe is that it is easy to back-paddle and pivot as a result of its smaller size, which means that you will be able to fight the current and stay in your desired fishing spot as long as you like. The canoe has a built in cooler, which you can use to store food or fish inside in order to keep everything fresh. The canoe also has storage under the seats, which will allow you to be able to keep your personal items and fishing gear dry even if it is raining outside. With a weight capacity of 800 lbs and a weight of just 95 lbs, you should have no problem being able to fit three people on board. This is a canoe that is highly portable and easy to put-in the water. Ideal for making sure you get the maximum amount of time out on the water and give yourself the best possible chance at catching a fish. If you are looking to get a canoe with a reasonable price tag and one that you can have peace of mind purchasing, you will like the fact that this design has a 2 year warranty on the hull and parts. If you are looking for a canoe to take on a trip with you, you are going to want something relatively compact and easy to haul around. This canoe is perfect for taking on trips due to its small size and comfort features. The canoe is capable of holding three people at one time thanks to its extra bow seat and it is a very durable design, which is what you want for long trips. The design feature features two comfortable seats on the bow and stern with a back rest on them as well as a middle bench seat if you want to hold a third passenger. The canoe has other comfort features such as a cup holder and storage in the center bench seat so that you can safely store personal possessions and all of your gear. The canoe design has a maximum load range of between 700 and 750 lbs, which is good in terms of allowing at least 2 people to be on the canoe at once. The design weights just 79 lbs, which makes it super easy to haul around by hand and load onto your vehicle or trailer for transport. The canoe has a strong thermoplastic hull design, which allows the canoe to be impact resistant and quiet out on the water so that you can watch the wildlife. The canoe does not have a square back on it, which makes the canoe more aerodynamic and increases the distance you get out of each stroke. The design has very comfortable handles and even contains rod holders in case you want to go fishing. In fact, this canoe actually has an anchor mounting point in place, which will allow you to be able to stay put in your favorite fishing spot if you desire. The design comes in a beautiful red color and has low, but comfortable seats. There isn’t a ton of storage in this design, but it helps to keep the price of the unit down, makes it a lighter weight and an overall more portable design. If you are looking to pick up a family canoe, you are going to want something that is of a decent size and something that offers a lot of storage capacity. This canoe is a perfect family canoe due to its three seat design. The canoe has a ton of storage space, perfect for storing family meals, personal items, bailers, bladders and first aid kits. Although this canoe isn’t massive, you will find that it is easy to move around and get into the water, which is great when you are canoeing with more than one person. The design has a molded storage tray in its design along with a water resistant hatch, which is great for storage of important personal items. The canoe has cup holders for your convenience and you will love the leg room that this canoe has to offer. This extra room allows all paddlers to be able to paddle without worrying about hitting the person behind them on their back stroke, which is always a good thing. If you are looking to get around the water at a fast rate, you are also going to be a big fan of the square end on this canoe, which will allow you to be able to mount a motor and rip around the water as fast as your motor allows. You can easily fit a trolling motor or a regular boat motor on this design to save you from having to do a lot of paddling. If you like to fish, you are going to be a big fan of the integrated cooler on the canoe, which will help to keep your fish nice and fresh even if you are on the water all day. If you sit on bow and stern of the canoe, you will find that there is plenty of room to cast your rod, which is great for reducing tangles. The seats on this unit are contoured for your comfort and if you are looking for maximum comfortability, you will also be pleased to know that this canoe possesses some quality carrying handles on it that won’t dig into your hands. This is a perfect canoe in terms of offering a blend of performance and flexibility as to what you can use the canoe for. If you want to get the best canoe for your money, you will want a design that offers you speed and durability. This design will allow you to be able to quickly move across the water thanks to its aerodynamic design, but it also offers a relaxing seat that you will have no problem sitting on long term. This single person canoe has a light weight 53 lb design allowing you to easily be able to take the unit wherever you desire. The canoe is easy to back-paddle and you should have no problem pivoting in the water with this canoe. The design is actually capable of being able to hold up to 450 lbs and with its streamlined design, you will be able to get more power in each of your strokes and travel through the current at faster speeds. The design incorporates aspects of a kayak as well as a canoe in order to allow you to be able to use a double sided paddle if you desire. The seat of the canoe is also quite high up in the air, which will allow you to be able to get a lot of power behind your strokes without sacrificing stability. This is a very durable unit thanks to a three layer hull design. This canoe is more than capable of being able to take a beating and it is actually fairly easy to paddle out or pull out of rough areas if you happen to get stuck aground thanks to its light weight design. This light weight canoe even allows you to be able to portage if you really want to switch up your location. The canoe has a removable seating design, which is great for transportation purposes or if you want to store your gear inside of your canoe to take along for a road trip. With the advanced comfort and convenience that this canoe offers, it is a design that you should make sure you consider. If you are looking to pick up a canoe for duck hunting, you are going to want to get something nice and quiet so that you don’t scare away the ducks when you are paddling around. You are also going to need something fast on the water so that you can get to the duck after you shoot it and before it sinks. This canoe will allow you to be able to do just that. This is a very fast, light weight, C-1 canoe that is extremely stealthy on the water and will allow you to be able to get quite close to ducks without them noticing. The canoe will allow you to be able to back paddle very fast with a huge amount of maneuverability, which means you can get to a duck no matter where it falls down on the water. The design is very slim and aerodynamic, which reduces drag and allows you to be able to use a single or a double paddle according to your preferences. The light weight design will allow you to be able to skim across the water with ease and at a fast pace thanks to the high seat height allowing you to be able to get more power into your strokes. The canoe is designed for solo use and has a comfortable, but simple webbed seat design, which helps to keep the price of the canoe down. With three color options to choose from, you are going to have a hard time finding something that you hate about this design. One thing that is especially going to peak your interest about this canoe is the low price tag. The unit may not have built in storage capacity, but there is plenty of room around you to be able to store any gear or supplies that you need. If you are looking to get an all around good canoe that can be used for all sorts of purposes on the water, you should have a look at this canoe. This canoe can be folded up for easy transportation and easy loading purposes. The design is easy to portage and is capable of being able to travel pretty fast on the water as well, making it a very good all around canoe for your money. The unit is made out of polypropylene and is very durable. In fact, this canoe has 15 year UV treatment, which is great if you still want your canoe to be worth some money down the road. Especially due to the fact that this unit comes with a rowing system and a pair of oars to give you more value for your money. The design is light weight and 14 feet in length, which is quite a large size. However, the unit does not take very long at all to assemble and you can actually put this canoe together in around ten minutes time. Disassembly of the foldable canoe takes around five minutes, which means you can be in and out of the water in just 15 minutes. The design comes packed in its own bags, which will allow you to be able to carry the canoe around and store it in a small sized sedan for transportation purposes. There is no need for a trailer to move this canoe around or even a roof rack for that matter, which is great if you want to save some money. The entire design weighs just 52 lbs and has two seats in it with plenty of leg room. 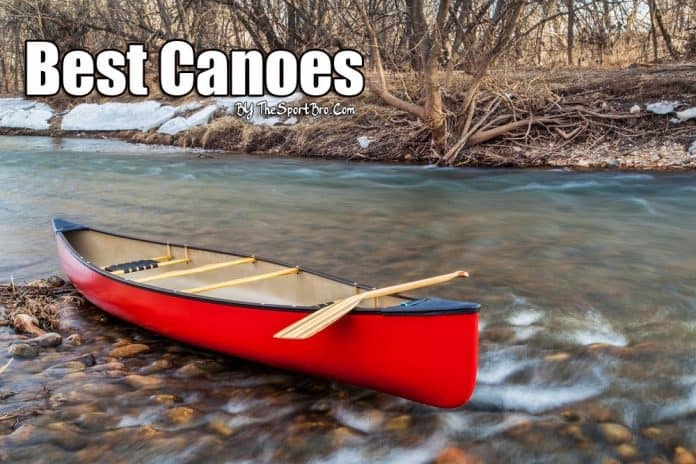 It is hard to find something that is 14 feet in length and that is such a low weight, which is why this is one of the best all around canoes on the market today. If you are looking to pick up a cheap canoe, you may definitely want to take a look at this design. When buying a cheap canoe, it is extremely important to look at the finer details of the canoe to make sure that the manufacturer didn’t cheap out on materials. This canoe is a perfect example of a design where the manufacturer put a lot of time and effort into the finer details of the canoe. The unit is made out of heavy PVC construction for durability and is equipped with comfortable foam padded seats so that you can be as comfortable as possible while out on the water. Pretty much everything that you could hope for in a cheap canoe and definitely a design that you should consider if you want to save some money. This two person canoe is an inflatable canoe that is designed with multiple air chambers to allow you to be able to stay afloat if one of the air chambers gets punctured. The design uses a traditional Boston valve for easy inflation and deflation of the canoe. This is a great canoe if you are worried about capsizing and want to keep your gear safe. If you want to have a canoe with comfortable seating, you are definitely going to be a fan of these foam seats. The design allows you to be able to adjust the seats to suit your height, which makes it a lot easier for paddling around on the water if you are a shorter person. If you are looking to whitewater canoe, you are not going to want to have the biggest canoe out on the water. You need something that is small and agile and that will allow you to be able to bail out of the canoe with ease. This is the perfect canoe for that purpose. The canoe has a high seat for easy bailing and is just 13 feet long, which brings a lot of agility to the table. A very high quality canoe for whitewater conditions and one that you should consider. There are three seats molded in this small size canoe thanks to an added bow front seat in case you want to bring a passenger. The three seats allow the unit to stay afloat on the water with ease and the canoe actually has quick release seat belts, which are ideal for whitewater rapid conditions. The design has handles on it so that you can easily move the canoe from place to place. With a convenient, small, lightweight design it is hard to not be a fan of how easy this canoe is to get in the water. You will also love the fact that this canoe is easy to bail and quite stable so that you can face wavy conditions more easily. Another awesome thing about this canoe for its size is that it actually has rod holders and a motor mount bracket in case you want to use the canoe recreationally and do some relaxing. If you are looking to grab a canoe for hunting, you are going to want something that is fast and that is comfortable to sit in for long periods of time. This is a perfect canoe for hunters thanks to its comfortable design loaded with features. The unit is designed to be sat in for long periods and has convenience features such as cup holders, storage under the seats and even a built in cooler. Definitely an ideal canoe to take for a long day of hunting. If you want a canoe that allows you to be able to travel at fast speeds, you will love the fact that you can mount a motor onto this canoe. Though, the unit is quite fast when just paddling, which is great if you don’t have access to a motor. You should have no problem back-paddling and pivoting this canoe according to your needs. The design comes in a very nice green design, which will help you to be able to blend into your surroundings if you are in the bush. The canoe also has plenty of room in it so that you can snoop down and not be seen if you desire. This additional room also provides lots of room for your gear and things like rescue packs and spare paddles. The design is built to be extremely comfortable. Contoured seats and a combination of convenience features like cup holders and storage will help make you feel at home. Definitely features that you should look for in a canoe that you are going to use all day long for hunting purposes. We hope that our list of canoes in 2019 has helped you be able to see some of the awesome canoe options that are available to you on the market. It is always important to make sure that you set a reasonable budget that is within your means and that you do your research before you purchase. Best of luck in finding a canoe to suit your needs, we hope that this list has helped you to find one.